Olympus has announced the 12MP Stylus 1, a compact camera with a 1/1.7-inch back-illuminated CMOS sensor, a constant f/2.8 lens offering an equivalent focal length range of 28-300mm and a large electronic viewfinder. Image processing is handled by the same TruePic VI engine as in the Olympus O-MD E-M5 (AKA the original OM-D). This enables sensitivity to be set in the native range of ISO 100-12,800. All this is crammed into a body with a casing depth of just 52mm (overall dimensions are 116x87x56.5mm), along with Wi-Fi connectivity that's compatible with the Olympus Images Share app for remote control and wireless image transfer. The lens is an 'ultra-slim' iZuiko Digital optic, and is specifically matched to the sensor. It also has an image stabilising element built-in to reduce the impact of camera shake by up to 5EV. In addition, there are 11 Art Filter modes available, which can be used when shooting Full HD movies at up to 120 or 240fps. Unlike many compact cameras, the Olympus Stylus 1 has a viewfinder built in. This is the same 1.44-million dot electronic device found in the OM-D E-M5. This EVF is backed-up by a tilting 3-inch 1.04-million dot LCD screen which is touch sensitive and uses capacitive technology to speed AF point selection and the like. Olympus has given the Stylus 1 an SLR-like shape that's very similar to the OM-D E-M1's, with a mode dial, control dial and direct movie button on the top-plate. Meanwhile on the front of the camera there's a sprung switch next to the lens to control zooming and a dial around the lens to control aperture and focus. 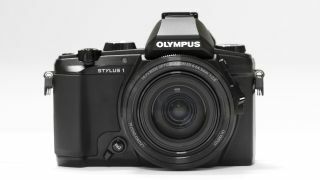 The Olympus Stylus 1 will be available in black for US$699.99/£549 from late November.